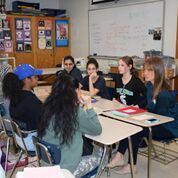 During the course of three sessions this April, North High School students focused on redefining the meaning of beauty, appreciating their own unique characteristics and accepting compliments. As part of the Hance Family Foundation’s Beautiful Me program, the workshops aimed to instill self-confidence, individuality, empathy and other positive values. Under the guidance of eleven teachers that were trained in the program’s curriculum and facilitated the gatherings, groups discussed what makes them beautiful and what they like best about themselves. Stories, videos and activities underscored the importance of self-acceptance and inspired the students to explore goals. Several North students that already went through the program came back to assist teachers during the sessions. Jenna Von Gretchen and Gabby Munoz were both moved by the content when they experienced it themselves for the first time and wanted to help their younger peers benefit as well. “I loved it from the start,” said Jenna. “It had a big impact and makes me want to make other girls feel like that,” said Gabby. Although the Beautiful Me program is geared toward girls, North, under the guidance of teacher Vanessa Coppeto, also implemented similar lessons for boys. While the Beautiful Me sessions were underway, the boys attended workshops in self-esteem, males’ perception of females, advertisements and their messages and how to change stigma in society. All students filled out “I am beautiful because…” signs following completion of the series. 1: Jenna Von Gretchen and Gabby Munoz were both so inspired by the Beautiful Me program that they now come back to assist with sessions for peers. 2: A group at North discusses the acceptance of compliments during the final Beautiful Me session.